I've uploaded a Test of Time Installation Guide. The installation process was made simpler by the recent release of the Test of Time Patch Project (see previous site update), which rendered several other third-party patches obsolete. Links to everything you need to get the game up and running have been consolidated into the one article. With a bit of luck, that's a few less forum questions and answers. The Test of Time Patch Project is a reverse engineering project by TheNamelessOne, with the aim to fix bugs and introduce features to Test of Time. Reverse engineers/Assembly programmers are a rarity in Civilization 2, even more so are those that are responsive to requests. TheNamelessOne is both. Project development is active at the time of writing. Features currently include 64-bit Windows compatibility (Edit Box bug fix), 100% core load CPU usage fix, custom resource placement, AI hostility fix, steal forbidden technology fix, and expanded limits for units, cities, money, population and map size. Grab it now. 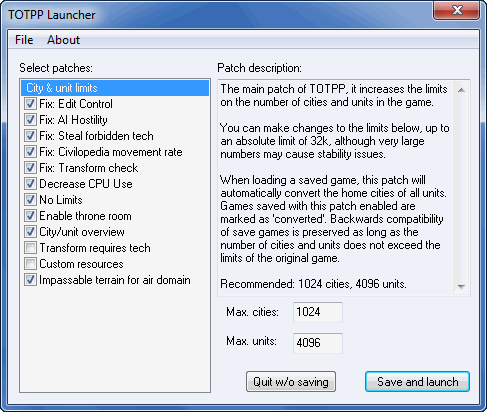 While on the subject of reverse engineering projects for old games, if you're a fan of Age of Empires II: The Conquerors, Scripter64's UserPatch is a must download. Core features are listed on the main page. Check it out.